Whether you are creating warmth and ambiance inside the home or roasting marshmallows over a blazing outdoor campfire, Tacoma Firelogs are the easy to use, clean burning alternative to wax based fire logs and cordwood. Now, it is easier than ever to have the brilliance of a flickering fire in your fireplace or woodstove. Free of any kind of binder material, Tacoma Firelogs are the environmentally friendly choice for safe burning. 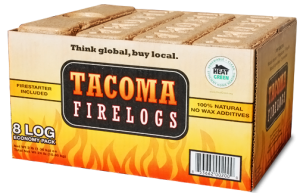 Tacoma Firelogs are 100% natural wood, fused together under extreme pressure using absolutely zero wax binders. The firelogs are safe for use in fireplaces, wood-burning stoves, fire pits, wood furnaces, and chimineas. We believe that it is our responsibility to find the best ways to utilize all of the wood we process, and we recognized that we werenâ€™t doing enough with our residual wood waste from the products we distribute at Fred Tebb and Sons. The solution was Tacoma Firelogs, a wax and binder-free, brick shaped fire log. Tacoma Firelogs are proudly produced in the Pacific Northwest. Our mission is to promote natural and renewable home heating options, and help reduce the use of carbon producing products like gas and oil. We use only natural fibers in an effort to avoid adding any additional carbon to the atmosphere produced from wax based products. Fred Tebb & Sons, Inc.